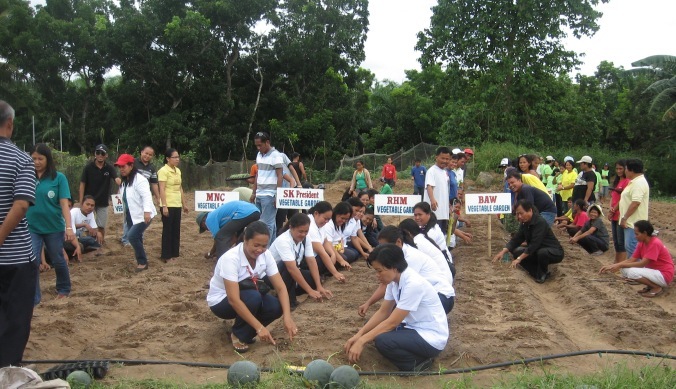 In observation of Nutrition Month, the Municipality of Talibon went on a vegetable planting spree at the Municipal Green House grounds, planting “pechay” (swiss chard) and “sibuyas dahon” (spring onions) last July 2, 2012. The Municipal Nutrition Council & Health Board proceeded to San Isidro for the vegetable planting straight from their 3rd Quarterly Meeting at the SB Session Hall. Upon arrival, other groups have already convened and were ready at their designated plots for the synchronized planting. Aside from the Municipal Nutrition Council, other groups present were: Barangay Nutrition Scholar (BNS), Barangay Agricultural Workers (BAW), Rural Health Midwives (RHM), Barangay Health Worker President (BHW), SB (Sangguniang Bayan), SK President, PNP-Talibon and a group from AKRHO. Even on a limited space, a variety of veggies were available at the Municipal Green House. You can see the trellised string beans and ampalayas, the plots of sweet pepper and the melons trellised inside the “white” house (because they were covered with white colored screens rather than green ones). Watermelons were planted outside and allowed to spread and at the sides, the already fruit bearing cardava bananas. The leftover watermelons from the last cropping were “for pick” for anyone interested and so, even if unripe, almost all carried a melon each. Even the smallest watermelon was not spared. Others availed of the string beans that were on display and for sale. July was designated as Nutrition Month in the year 1974 under Presidential Decree No. 491; known as the “Nutrition Act of the Philippines” wherein nutrition was declared as a priority of the government and so was implemented in all branches of the government. The National Nutrition Council (NNC) was created as the highest policy-making and coordination body on nutrition. They were mandated to formulate, monitor, coordinate, and evaluate the national nutrition program. Because of this mandate, it has been the practice to observe the Nutrition Month every July with programs such as massive weighing of preschool children to locate and identify the malnourished and the organization of nutrition committees to facilitate coordination with local chief executives as chairperson. 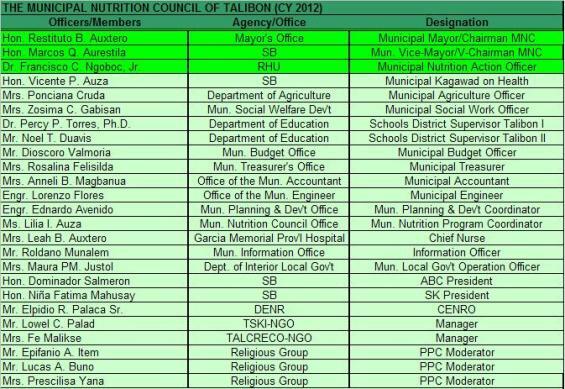 In Talibon, the above programs are only one of the many programs that the municipality has set up. 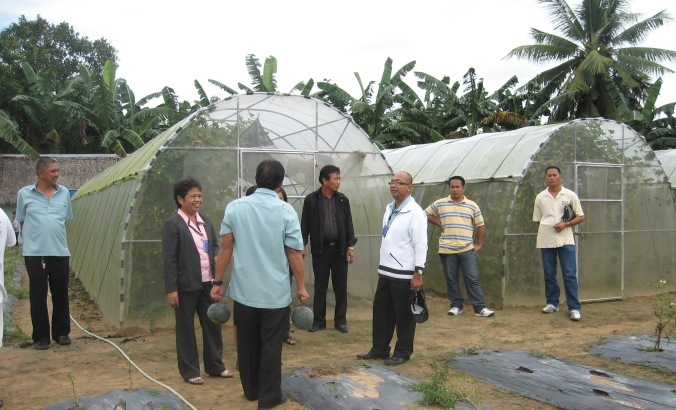 The planting of vegetables is one priority thus the establishment of the Municipal Green House. Also, each Talibon household has been instructed to plant vegetables in their backyards such as the “malunggay”, “saluyot”, “alugbati”, “ampalaya”, “pechay”, squash, sweet potato, tomatoes, spring onions, and sweet and hot peppers, among others. Others adapted container gardening when space is not available. Because of their nutrition initiatives, the municipality has been a consistent winner since 1998 up to 2010. Since then, they always received the Green Banner Award, the yearly topmost award to be given in the province-wide category. 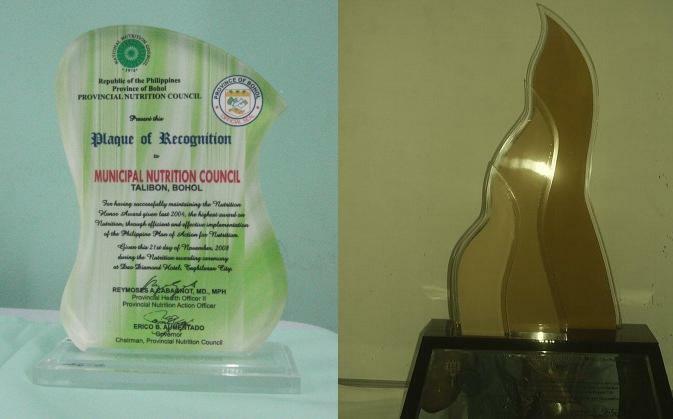 After three consecutive winnings (1998-2000), the Municipality of Talibon received the “CROWN” award: Consistent Regional Outstanding Winner in Nutrition award. 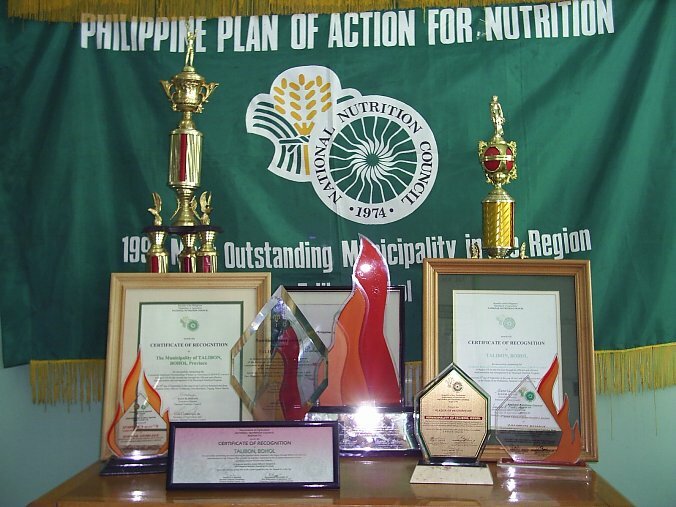 And after six (6) years of consistent winnings, the National Nutrition Council gave them an award known as the NNHA or the National Nutrition Honor Award; both awards were given at Malacañang Palace by the President of the Philippines.